Collaboration, effective communication, and engagement between public and private sectors will be key to strengthening trilateral relations between the United States, Japan and Korea during a period of upheaval and change. That was the consensus reached today between current international experts and college students who came together to discuss the future of trilateral relations from a multi-generational perspective. The Fourth Annual U.S.-Japan-Korea Trilateral Symposium, hosted today by International Student Conferences with support from Sasakawa USA and the Korea Foundation, included discussions on challenging issues including security and human rights in North Korea, women in leadership, and the overall future direction of trilateral cooperation. The symposium bridged the gap between current-day experts on international affairs and students, representing universities from Tokyo to Seoul to New York, who will take up the torch as the next generation of leaders in U.S.-Asia relations and policy. Symposium panelists pointed to the whirlwind election of 2016 for the United States, remaining historical issues between Korea and Japan, and the recent political scandal surrounding South Korean President Park Geun-hye as putting all three countries in a position where cooperation has rarely been more important. For this new paradigm, new ideas are needed from new places — and events such as trilateral forums are a great way to generate them. In the first panel on security and human rights issues involving North Korea, panelists addressed the growing nuclear threat posed by the Kim Jong-un regime, which threatens both South Korea and Japan, as well as American bases in the Pacific. While negotiations have been the preferred method to deter threats, panelist Bruce Klingner, a senior research fellow at The Heritage Foundation, pointed to the literally hundreds of former agreements North Korea has reached with South Korea and others, all of which have failed. “We need to be, I think, clear eyed about the viability of negotiations,” he said. “It is critical,” he said, that the three nations collaborate to find solutions to such problems. Student panelist Sophie Osborn, a Korea-America Student Conference KASC U.S. Chair representing UC San Diego, noted the solution may be found in more grassroots and people-to-people interactions between the nations, as opposed to the government-to-government initiatives that have not yet achieved stability for the region. Panelist Greg Scarlatoiu, Executive Director of The Committee for Human Rights in North Korea, expanded on that idea, saying that civil society and forums such as those created today are a good way to foster conversations on difficult topics. Panelists for the day’s second panel on women and leadership in the three nations reached similar conclusions, expressing the importance of hearing a diversity of voices on the topic of gender equality and advocating within the government, the private sector and civil society to effect change. “Declaratory policy, by itself in a vacuum, is not effective,” noted panelist Pamela Reeves, senior fellow at Brown University and advisor to the office of Melinda Gates. The policy must be understood and embraced by all sectors, she said. 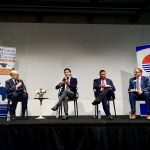 Ambassador Young-jin Choi, former Ambassador of the Republic of Korea to the United States, delivered the keynote address, speaking on U.S.-Japan-Korea cooperation and dealing with issues such as an increasingly assertive China. 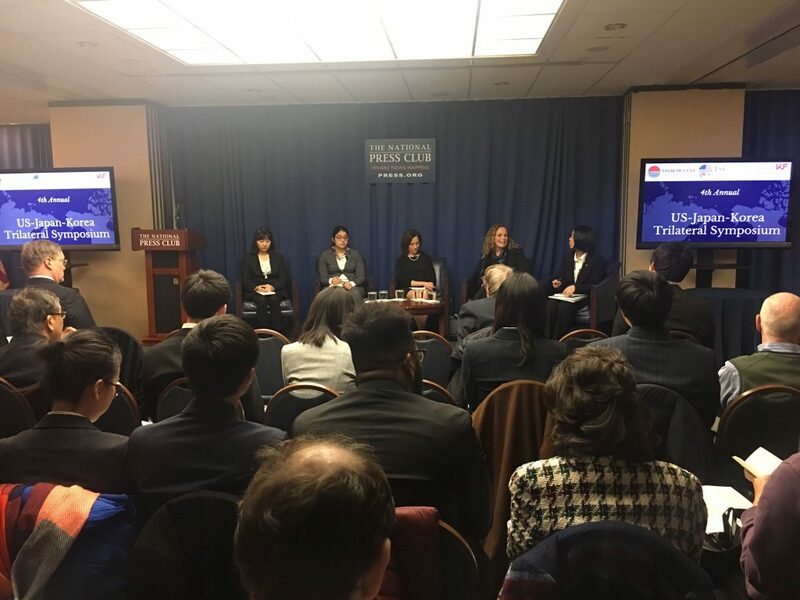 Choi also spoke as a member of the final panel on recommendations for future administrations — most immediately within the United States but also for future leaders in South Korea and Japan. In the short term within the U.S., prospects are still uncertain as President-elect Donald Trump builds his team and begins asserting his priorities. “We’re going to have a difficult slog in the first year… our transitions in the U.S. are long and slow,” said panelist Randy Schriver, a partner at Armitage International and CEO and President of Project 2049 Institute. During that transition period, he said, the U.S. ability to implement Asia policy will be limited. Student panelist Jon Foissotte, a Japan-America Student Conference U.S. Chair representing Johns Hopkins SAIS, noted that communication will play an even more important role as a tool for diplomacy during this period of uncertainty. Student Panelist Avelino Fujimoto, a Japan-America Student Conference Japan Chair representing Gunma University, expanded on that point, saying dialogue is key to discussing difficult historical issues that remain between the three nations.